On December 30th, the SEC significantly expanded its use of the XBRL data provided by public companies with their 10-Q and 10-K filings. It launched a new program that is designed to “facilitate investor analysis and comparisons of public company financial statement data” by consolidating the “data that companies provide in structured formats” into data sets that will be “posted for bulk downloads on the SEC’s website.” The program will begin using only the information provided in the base financials, but it will soon include data from the footnotes as well. The purpose of this program is to promote and expedite the use of XBRL data by investors and academics. We are very happy that the SEC has begun using XBRL in this way. This step begins to validate the commitment we have long made to creating top-quality code that exceeds the standard of SEC compliance and is entirely useable for analysts and investors. We are gratified the SEC has taken these steps, because the XBRL code we submit on behalf of our clients is excellent, compliant, and useable. In the data sets the SEC has released, there will be a lot of code that was built by providers who outsource the XBRL overseas, or who have otherwise made a lesser commitment to quality XBRL data. Additionally, there will be a fair amount of code built by the reporting teams at individual companies who have taken the responsibility of properly structuring XBRL in-house. When the XBRL is poorly built, or created by people who are not CPAs and experts, there is a risk that the information made available by the SEC in these data sets will be an inaccurate reflection of the companies’ financial information. Investment decisions by analysts and enforcement decisions by the SEC will be driven by the code in the XBRL data, and for that reason RDG has–since its very inception–been committed to having the best people creating the highest quality code. XBRL is the future of financial disclosure, and RDG can help public companies create excellent and usable data. 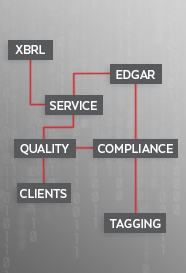 Please contact us to learn more about our Full Service Tagging Services and our XBRL Quality Assurance Services. Feel free to contact me any time.